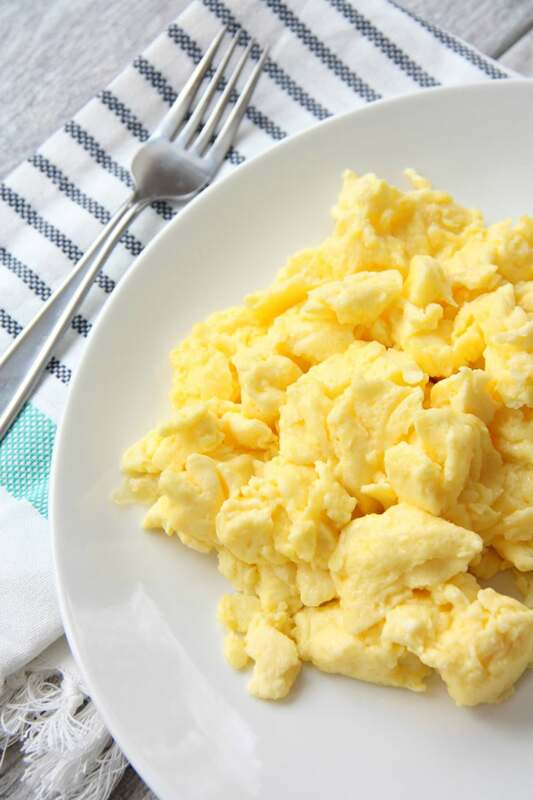 I know, I know, scrambled eggs are considered an easy dish to make, but there was a time long ago when I didn’t know the secrets of perfect egg scrambling and chances are there are others out there. If you already know how to scramble an egg check out some of these awesome breakfast dishes. Now, for those who want to learn how to make delicious, yellow, fluffy eggs, here we go. The key to fluffy eggs is whisking. You better have a whisk and some muscle power ready for this, you’ll need it. Whisking incorporates air and air makes eggs fluffier. Fluffier is better, right!? Also, NO high heat. You want the heat to be medium-low. One of the only things I remember from Home Ec in 9th grade was when my teacher said, “eggs like low heat.” I don’t know why, but it has obviously stuck with me. Scrambling eggs isn’t a race, you don’t have to rush to get them cooked. Be patient or you’ll end up with rubbery, flat, brown, ugly eggs. Ugly eggs are still edible, but this post is about beautiful eggs. Here’s the recipe I use, but you can change the amount of eggs and milk by remembering this ratio: 1 Tablespoon of milk per egg. Easy as that. Crack eggs into a bowl, make sure it's big enough so you don't spill with vigorous whisking. Beat until they turn pale yellow. Thin your egg mixture with the milk and now whisk like crazy. Use those muscles and get a good work out. If you're not up for that you can use a hand mixer or stand mixer with the whisk attachment to do the job. Either way, you are trying to incorporate as much air into those eggs as possible. Heat nonstick skillet over medium-low heat (remember NO high heat). Add the butter and let it melt. When the butter in the pan starts to bubble or is hot enough to make a drop of water hiss, pour in the eggs mixture. Don't stir! Let the eggs cook for up to a minute or until the bottom starts to set. Sprinkle the egg mixture with salt and pepper to taste (about ¼ tsp. salt to start). This is the time to add minced herbs, shredded cheese, sautéed mushrooms, chopped tomato, or anything else you like. With a wooden spoon, start to scrape the eggs from the edge of the pan to the center, forming large soft curds. Repeat until there is no liquid left. Turn off the heat and continue gently stirring and turning the egg until all the uncooked parts become a little more firm. Transfer to a plate when the eggs are set but still moist and soft. Eggs are delicate, so they'll continue to cook for a few moments after they're on the plate. You’ve done it! Enjoy those eggs! We wrapped ours in a warm tortilla with avocado slices, spinach, tomato, and salsa for a delicious vegetarian breakfast burrito for dinner. MMmmmm….so good! If you want to make your hard boiled eggs to perfection, try making them in an Instant Pot! Here is a step by step to make the perfect hard boiled egg! That is a very good idea to make a soft and fluffy egg! I love scrambled eggs. I have never taken the time to whisk them long enough to incorporate air for fluffiness. I also never knew the ratio of milk!